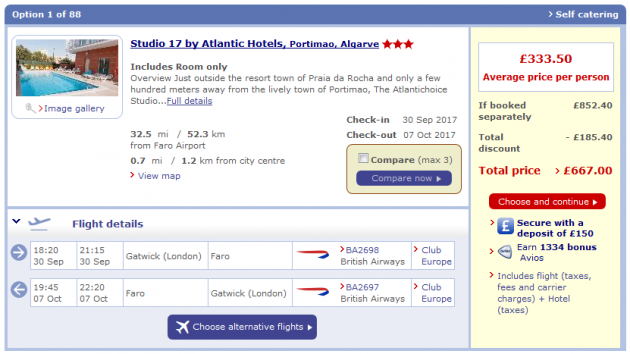 British Airways has loaded a short Club Europe holidays sale, with advertised prices starting at £388 per person for 7 nights in Portugal, including Business Class flights from London Gatwick. Other available destinations include Dalaman, Malta, Paphos, Ibiza, Malaga, Brindisi, Cagliari and Nice. In practice, the headline advertised prices include minimum 4* accommodation; less expensive 2* and 3* options are also offered, making the cheapest 7 night deal with Business Class flights just £333.50 per person. British Airways Holidays Club Europe flights earn full Avios and Tier Point credit in the airline’s Executive Club programme, and also benefit from bonus Avios and the option to pay on a deposit and balance basis. Passengers originating in UK regions may also be able to combine domestic sectors (at extra cost) in their arrangements, which will book into the new domestic Club Europe cabin and earn an extra 80TPs round trip. An airport change or overnight may be required in London, however. For full details and to book by midnight on Monday 12th June 2017, visit ba.com. British Airways is offering £100 off a selection of holidays in a 5 day Black Friday and Cyber Monday deal, based on two passengers travelling in economy. 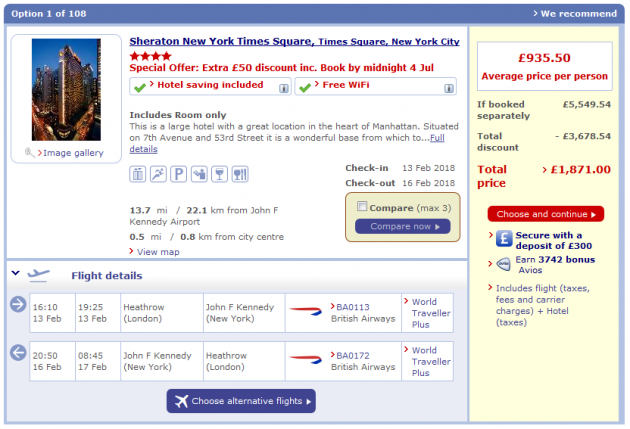 The discount combines, notably, with the concurrent reduction in World Traveller fares to New York, meaning that three night breaks are on offer from £507 per person including flights and accommodation. The discount is also available when travelling in World Traveller Plus (premium economy) and it is doubled to £200 per couple when travelling in the airline’s Club World business class and First Class cabins. With the Continental Club discount code ‘5NOVB14‘ valid until the end of November, the onhotels.com rate comes down to £153.90 per night, or a total of £461.70 for the three nights. That makes a grand total of £1258.02 for the couple travelling when booked separately – £110.02 more than booking the BA Holidays package for £1148. You may also notice above that members of the British Airways Executive Club will earn a bonus 2296 Avios, on top of the Avios earned for the flights themselves. Holders of a British Airways American Express card can then earn up to an additional 3 Avios per £ spent on the trip, and the flights will also qualify for OnBusiness SME corporate rewards too. 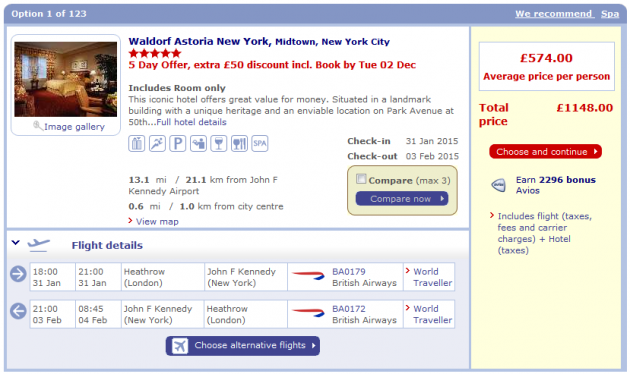 Finally, trips booked as a package with BA Holidays are fully ATOL-protected. For full details on all the destinations, hotels and rental cars available in this promotion, which must be booked by midnight Tuesday 2nd December 2014 to benefit from the discount, visit ba.com. 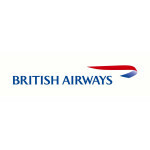 Through its British Airways Holidays division, ba.com offers not only flights and ‘flight plus’ packages, but also the ability to book standalone hotel and car rental arrangements. 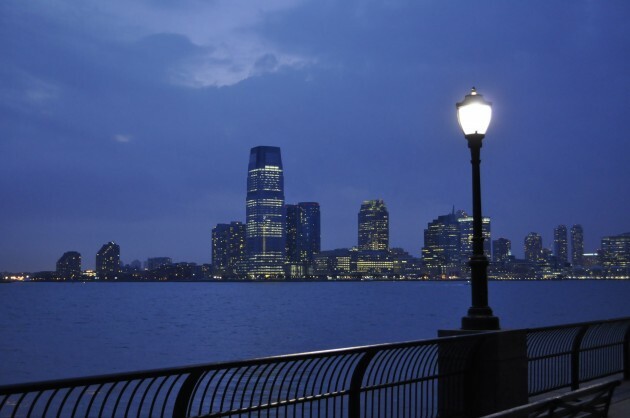 And, until April 28th, bookings at hotels in the USA attract a 10% discount. There’s no promotional code for this offer; the discount shows up on the hotel listings page and apparently applies to all room types. Although hotel rates are dynamic and these kind of ‘codeless’ offers can be difficult to validate for the real level of saving, recent tracking suggests that these are indeed genuine discounts. 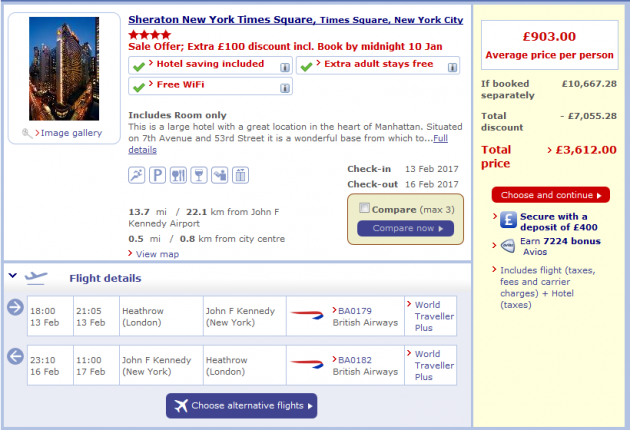 More practically, comparing BA rates with those available from other agents shows some definite savings against the best rates elsewhere. We looked at the above example, at The Bellagio Las Vegas, and found that the rate undercuts all but one other online provider at the time of checking. However the BA rate also includes the USD20 per day resort fee, meaning that the total cost with BA is indeed cheaper in real terms. On selected dates and at hotels where other pre-existing offers apply, such as ‘fifth night free,’ the 10% off deal appears to stack on top of the original promotion and both savings are available. For more details and to book, visit ba.com.